WICHITA, KS--(Marketwired - Dec 9, 2013) - Performance matters and when motorists visit oil change locations they need to know that the oils they purchase are the right viscosity grades for their vehicles and API-licensed for performance and protection. Universal Lubricants agrees and has supported the American Petroleum Institute (API) Motor Oil Matters (MOM) program since its inception. After decades of licensing oil manufacturers for the quality of their lubricants, API established MOM to protect the quality standard once the oil leaves the blender's facility. MOM extends API's chain of custody standard to distributors and oil change locations, ensuring that the proper quality motor oil is put in every vehicle. As a participant in the MOM pilot program, Universal Lubricants is one of a handful of providers working with API on this licensing program, which includes random product tests and annual supply and delivery audits. The company manufactures and distributes high quality lubricants, including Eco Ultra® Synthetic Blend Motor Oil, made from re-refined EcoClear™ base oil. "API's MOM program is still in its infancy, but some OEMs are starting to require that their dealerships participate," said Mike Wyant, Universal Lubricants technical services manager and a member of API's Motor Oil Matters Task Force. "API is trying to cover the entire chain of custody of the product, making sure the blender, distributor and installer provide the high quality motor oils motorists expect." More than 1,000 motor oils dispensed from bulk tanks over the last five years were purchased and tested by API. The organization reported that nearly 20 percent of the bulk oil samples tested failed to meet API standards. Test results were compared against thousands of licensed oil formulations to determine the identity of the oils and verify that oils met the claimed performance level. Universal Lubricants, a recognized leader in environmental services, is licensed by API as both a manufacturer and a distributor of quality motor oil. 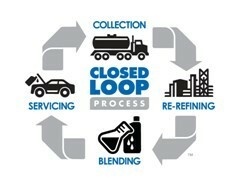 The company's closed loop process is an infinitely repeatable, sustainable, self-contained system for collecting used oil, then re-refining, blending, servicing and distributing it as clean, purified, high performance lubricants. Wyant said that motor oil is the lifeblood of every engine. "An inferior base oil could oxidize rapidly, lose its lubrication and flow properties, and thicken exponentially. If oil doesn't flow and lubricate your engine, it might seize and fail to operate. That's why it's important for consumers to know what they're getting with their oil changes. Oils that meet the latest ILSAC or API standards carry the API Starburst or API Donut. Consumers should always consult their owner's manuals when determining what engine oils to use and double-check their receipt to confirm that their service provider used the motor oil they requested," he said. For more information about Universal Lubricants' closed loop quality standards and high performance lubricants, please visit www.universallubes.com. Founded in 1929, Universal Lubricants is a driving force in used oil collection, base oil refining and distribution. Through its closed loop process, the company collects, re-refines, blends and re-distributes its own engine oils and lubricants -- never losing guardianship within the chain -- to ensure that every quart is of the highest quality for optimal performance. Universal Lubricants operates 32 facilities nationally, including one of the world's most technologically advanced re-refineries in Wichita, Kansas. A leader in research and development, Universal Lubricants is a Pegasus Capital Advisors portfolio company and employs more than 390 workers. For more information visit www.universallubes.com. Universal Lubricants' infinitely repeatable closed loop cycle transforms used oil into clean, purified re-refined oil that provides the highest levels of performance, licensed by API and approved by MOM.